“To love another person is to see the face of God.” To watch this musical or even to listen to the complete symphonic recording of it is to know heaven. 1. Les Miserables at the Palace Theatre, London, 1986. British audiences do not, as a rule, give standing ovations. In the three years I lived in England and the three extended visits when my parents were living there, I saw a total of four standing ovations. One was for Sir Laurence Olivier as he entered the National’s Lyttleton Theater to watch his wife in Mrs. Warren’s Profession. The second was for Choreographer Sir Frederick Ashton when he walked onto the Convent Garden stage during a curtain call after one of his ballets. The other two came during a single performance of Les Miserables: at the interval just as the cast finished singing “One Day More,” and at the end. For my own part, I was in tears both times, and a few other times during the musical, too, especially at “To love another person is to see the face of God.” To watch this musical or even to listen to the complete symphonic recording of it is to know heaven. 2. The Lion King, New Amsterdam Theatre, New York, 1999. Of course, it was sold out. Our hotel concierge, though, said we could stand in line to get returns, so after a day at, fittingly, the Bronx Zoo, we got in the line outside the theater some 2 1/2 hours before the doors opened. Amazingly, we inched all the way up to the ticket window and snapped up front-row balcony seats at $85 per. Just five minutes into the show, every minute of the wait and every cent of the tickets had been paid back fivefold as the puppet animals made their way through the theater, paying homage to the birth of a new lion king to an Africanized version of Elton John and Tim Rice’s “Circle of Life.” The rest of the show kept delivering, too. The Broadway Cast recording of The Lion King is more than just part of our Elton John collection: it’s one of my favorite albums, always rekindling the awe of what I consider the greatest five minutes in musical theater history. 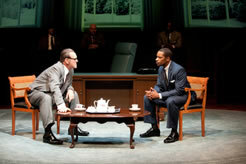 Jack Willis as LBJ and Kenajuan Bentley as MLK in the Oregon Shakespeare Festival production of Robert Schenkkan's All The Way. Photo by Jenny Graham, Oregon Shakespeare Festival. 3. All the Way, Oregon Shakespeare Festival, Angus Bowmer Theatre, Ashland, Ore., 2012. "Perfect" is how Sarah described this production, and I'm in full agreement. Great subject matter—LBJ's passing the Civil Rights Act of 1964 and integrating the Mississippi delegation to the Democratic National Convention—and uniquely iconic figures of American history were cleverly packaged in a tight script by Robert Schenkkan and energetically directed by Bill Rauch. The superb ensemble of 15 actors shifted in and out of 37 roles, led by Jack Willis as President Johnson and Kenajuan Bentley as Martin Luther King Jr. This may have been a talk-heavy political history, but it played as exciting as a Bourne film. Funny, profane, profound, tense (even if we did know the outcomes), this was Shakespearean in scope, Shakespearean in quality. The play eventually made it to Broadway where it nabbed a Tony for Best Play and Bryan Cranston won for his portrayal of Johnson.Click here For a review of All the Way. 4. 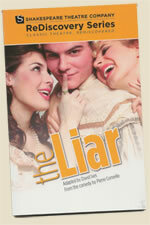 The Liar at the Shakespeare Theatre Company’s Lansburgh Theatre, Washington, D.C., 2010. We were laughing for almost three hours straight. And when I say that one of the night’s biggest laughs came on the line “You may be a bivalve, but you are my valve,” just trust me that we were laughing not because this was a laughably bad play but because that line so cleverly fit the characters and moment perfectly. This was one of those “you had to have been there” funnies I just can’t adequately describe; it’s kind of like trying to explain the humor in SpongeBob SquarePants to people who’ve never seen it (and some who have seen it, for that matter). Yet, this was a French classic, the original by Pierre Corneille liberally adapted by David Ives, though he maintained much of the plot and the rhyming couplet verse structure. This production also featured the best swordfight I’ve ever seen staged—without swords. Dorante, the title character played by Christian Conn (no kidding), is such an expert at lying he convinces a hot-headed rival (Tony Roach) by verse that they are dueling though neither has pulled out his sword. OK, you had to have been there. Click here for my attempt at a review of The Liar. 5. Anthony Hopkins in Pravda at the National Theater, London, 1985. Before he was Hannibal Lecter, he was Lambert Le Roux. In Howard Brenton’s and David Hare’s bitingly funny play, the South African Le Roux is a Rupert Murdoch–like newspaper mogul who has taken over a couple of London’s daily newspapers. Hopkins' performance was so commanding, I found myself for months afterward unwittingly slipping into his stance (legs apart, feet pointed outward, ramrod straight back Pisa-leaning forward), and even his speech (with guttural growl and slightly sinister lisp, ending each phrase in an upward lilt and turning every sentence into a truth-impenetrable proclamation). This was his first of a three-play engagement at the National Theatre; he followed it with an awful King Lear but concluded it with the great Antony and Cleopatra opposite Judi Dench (No. 3 on the Top 40 Shakespeareances). I’ve seen many of Hopkins’ movie roles, including his award-winners, but his Antony was greater than any of those, and his Le Roux was greater, still.